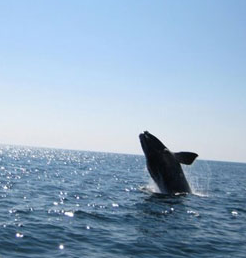 Researchers at the New England Aquarium are moving forward in their mission to save the critically endangered North Atlantic right whale, and have recently discovered another potential threat to this small population of 400 whales. It is widely known that whaling decimated these whales before they were protected in 1935 and that deaths and injury from vessel collisions and fishing gear interactions are the major culprits in this century. However, what is less widely known is that compromised reproduction is also limiting the recovery of this species, leading researchers to look to the environment for the cause. Aquarium scientists are currently looking closely at a marine biotoxin produced by algae called domoic acid, or DA. DA is a potent neurotoxin that is commonly found in shellfish and has caused deaths and serious illness in humans, as well as thousands of deaths, neurological disease and abortions and stillbirths in California sea lions. 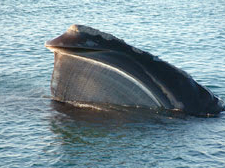 A right whale’s natural diet consists of huge amounts of copepods , which are rice-grain sized zooplankton that accumulate DA and pass it on to right whales. Our studies show that right whales are exposed to DA every year, and in high enough doses this can have potentially disastrous effects. Research is currently being conducted to discover the potential for long-term effects of DA in right whales, including what impacts it could have on reproduction, overall health and this species’ survival. 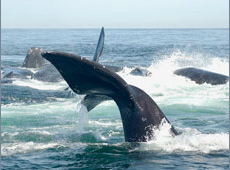 To learn more about what researchers at the New England Aquarium are doing to learn more about right whale reproduction and health, visit our webpage: Right Whale Conservation Medicine Program. This work is supported and permitted by National Marine Fisheries Service (NMFS). All work and images are under scientific permit from NMFS.